Single shaft concrete mixer can mix plasticity concrete, rigid concrete, light aggregate, mortar, etc. It has the advantages of wide application range, good mixing quality, high production efficiency and low energy consumption. Therefore, it is an ideal choice for construction sites as well as small and medium sized concrete batching plants. The mixing principle of single horizontal shaft is basically similar with self-falling concrete mixer . 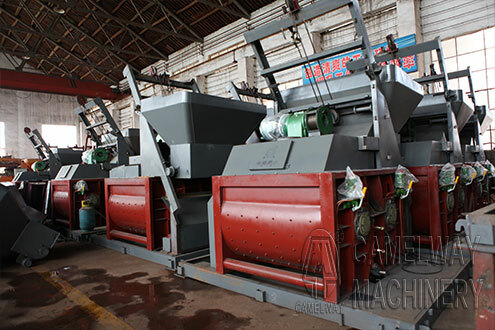 The function of its shafts and blades is to raise the aggregates to a certain height, and then make them fall freely. Therefore, in operating process, the effective working volume of single shaft concrete mixer is larger than theoretical designed volume. The overall height of single horizontal concrete mixer is bigger than double shaft concrete mixer.